Interesting place with a nice selection. Visited twice, located near to a well-served tram spot, you need to get the tram to come here, one of the nearby metro station is far away and located on a very high bridge and complicated to get from there to here, up there the view at night is awesome. Awesome views are plenty in Prague. Visited twice and sat both times in different bars, cellar bar had quite a bit more taps than the ground level one, not all are open always at the same time and they have different taps. Prime selection of small largely Czech breweries from classical to modern style, great condition of beers. Very friendly service, fluent English. Visitors are all locals largely it seemed. Old school comfy bit bare bones feel in a good way. Smallest pours are 300 ml. or 400 ml. Low maze, few Germans on tap and bottles available some imports. Very comfy place. Maze-like feel due to the several room. There is traditional food. For a classic Czech bar in Prague this seems the top place given vast and good selection, comfy and far away from tourist hurdle hopefully still not spoiled by people popping in like me. Wonderful place for just drinking. NOTE: Cash only. Currently the pub with the most draft beers - 38! 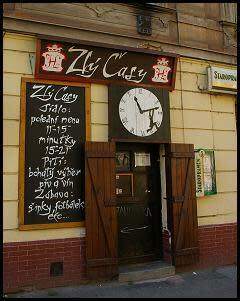 This three level bar has fast becoming an institution on Prague's beer scene with its eclectic choice of guest beers. The"Evil Times" was originally a brick-lined cellar bar, now on 3 levels and a beer garden with up to 38 guest beers on tap usually including Kácov and maybe Joe's Garage and Kocour. The upper bar is usually open until 1pm ish? It is all No smoking. The kitchen offers a daily lunch menu and a specials board which usually includes the renowned black beer sausage, or a delicious brie cheese.